Two years ago a there was a terrorist attack in Likoni that left several Injured and over four people dead. One of the survivors of the incident was baby Satrine Osinya who was hit by a bullet in the head but by the grace of God Senator Mike Sonko came to his rescue and underwent a successful surgery where the bullet was removed. Baby Osinya Lost her mother in the tragic attack but since then his life has changed after Nairobi Senator Mike Sonko took him as an adopted son. 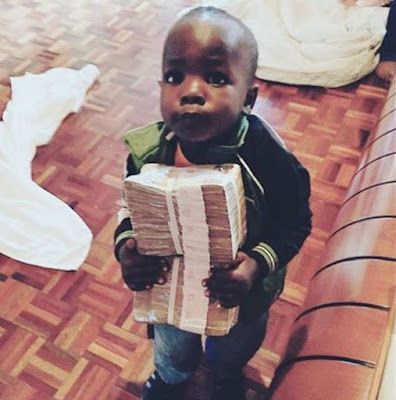 Well the young lad has been enjoying finer things in life in his new family and his father Mike sonko took to social media on Monday to endorse him as the newest millionaire in town. Osinya is holding a bundle of cash almost his weight. “Osinya is the newest millionaire in town”. Sonko captioned the photo below.